It includes the nerves that arise from the brain and spinal cord. There are twelve pairs of nerves which directly arise from the brain and called cranial nerve. Similarly, there are 31 pairs of nerves that arise from the spinal cord and called spinal nerve. They connect the organ system to the brain. It is the system of ganglion and sub-ganglion. The local swelling of nerves in organs are called ganglion and further swelling of nerves to various part of the organ is called sub-ganglia. It is divided into sympathetic and parasympathetic nervous system. The function of ANS is to maintain body steady state rapidly. Cranial Nerves: They arise from brain and terminate inside it except the Vague. There are 12 pairs of cranial nerves in human beings. They control the activities of eyes ears and tongue etc. Spinal nerves: They arise from the spinal cord and spread to different parts of the body. There are 31 pairs of spinal nerves in the human beings. Out of them,8 are cervical 12 are thoracic 5 pairs of lumbar 5 pairs of sacral and 1 pair coccygeal nerves. 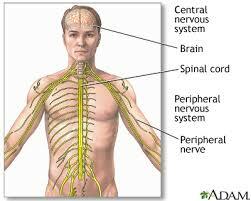 Peripheral nervous system includes the nerves that arise from the brain and spinal cord. There are 31 pairs of nerves that arise from the spinal cord and called spinal nerve. They connect the organ system to the brain. Cranial Nerves arise from brain and terminate inside it except the Vvague. Spinal nerves arise from the spinal cord and spread to different parts of the body. How many numbers of cranical and spinal nerves are present in human body? There are 12 pairs of cranial nerves and 31 pairs of spinal nerves in human body. The nerves that arise from brain and terminate inside it except the Vague is called cranical nerves. What is the main function of glands in human body? The glands in human body produce different hormones or enzymes. With the help of glands, different body parts function in proper way. The rapid conduction of message in the form of electrical impulses from one part of the body to another and co-ordination of the body activity is called nervous system. How do endocrine gland differ from exocrine gland? The endocrine glands do not bear a duct and the hormones produced from them are directly mixed up with the blood. The exocrine glands bear duct. ______ includes the nerves that arise from the brain and spinal cord. Which of the following is a part of the peripheral nervous system? The function of spinal cord is ______. To control the motion of the body. To break down food to be used by the body. Which of them consist of a chain of ganglia? There are ______ pairs of crinal nerves in human beings. How to increase adenaline hormone? 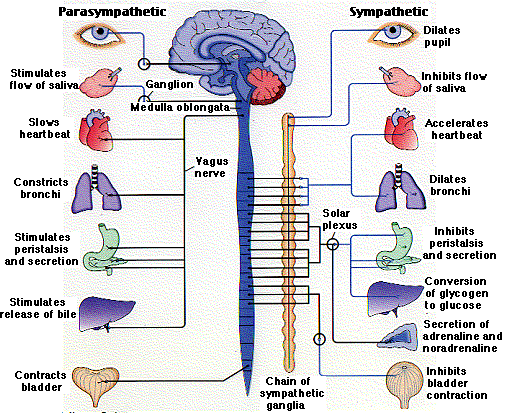 Any Questions on 'Peripheral and Autonomic Nervous System '?